These are Professional Quality Microfibre cloths. 250 gsm Microfibre - not cheap lightweight material. They are perfect for many applications - car detailing/polishing cleaning around the home, dusting and polishing. Microfibres have a better grip of tiny dirt particles. Dust, dirt, and bacteria naturally cling to the microfibres making them excellent for LCD and plasma televisions, computer screens, cleaning and polishing cars. They are lint and scratch free. They can be used up to a staggering 400 times with no deterioration in their cleaning performance. 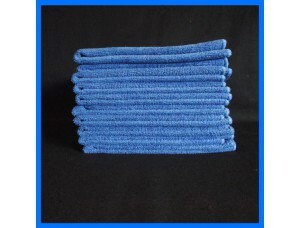 A Microfibre towel will pick up dust, surface residues and microscopic particles. M-Cloths have 90,000 tiny hooks per sq inch that lift the dirt while you wipe. Wash at 60 °C with no Softeners or Fabric conditioners. Please Note: When you place your order please can you fil in the "Where did you hear about us" bit. So we can see where you heard about Bullet.